Copy and cut out the gingerbread man pattern. Download it here. Fold your A4 sheet of brown felt in two and pin the paper pattern to the front, going through both layers. Cut around your pattern so that you have 2 identical ‘man-shaped’ pieces of brown felt. One is the front and one the back. Using a pencil, mark on the front piece of your gingerbread man where you want the eyes, mouth and buttons to go. You can copy the colours and design of our gingerbread man in the example here or use your own design. Using some red embroidery thread (2 strands), use a couple of stitches to sew the eyes (2 small beads) in place, securing the end of the thread at the back of the felt (which will be the inside of the decoration). Using the red embroidery thread (2 strands), and a simple back stitch, sew the smile of your gingerbread man using your pencil mark as a guide, again securing the ends of the thread at the back of the felt. Tie a bow with the piece of ribbon you have chosen and sew this in place with a couple of stitches around his neck. Cut the ends of the ribbon diagonally to look pretty. 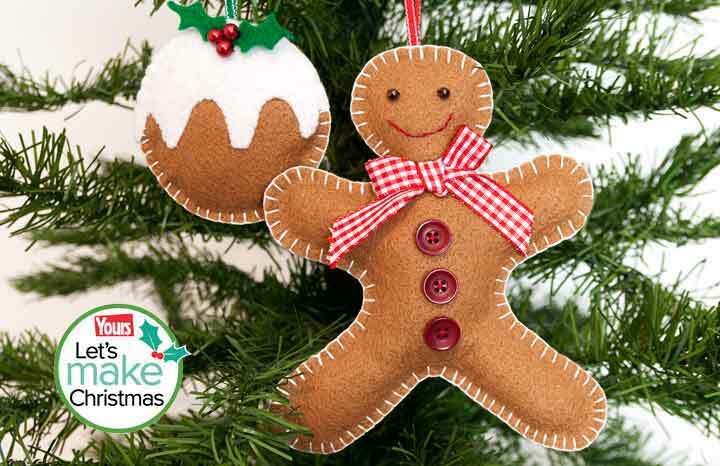 Finally, sew your 2–3 buttons in place along his tummy and the front of your gingerbread man is prepared! Cut 15cm of thin ribbon (your hanging loop) and sew the two ends to the wrong side of the back piece of felt at the top of the head. Place the decorated front on top of the back piece of felt that has the hanging loop attached, i.e. wrong sides are together enclosing all your stitches. Nearly there…. With the two pieces of felt lined up next to each other, sew a blanket stitch (see p.102 of the book for how to do blanket stitch) around the edge of your felt to join the two pieces together securely. Use 3 strands of the thread for a slightly thicker stitch and work in approx. 4–5mm stitches, keeping them as even and regular as you can. Before you get all the way around the edge, stuff the inside with a small amount of toy stuffing or wadding to fill him out slightly. Finish the remaining few stitches, cast off your thread and your seasonal gingerbead man is alive and kicking! Spend some time arranging your beads and buttons before you start sewing to achieve a good design. This is the fun part, where he begins to come to life! You can build some real character into your gingerbread man by using mis-matching buttons, ribbon or beads. Try changing the way that he smiles or maybe frowns! You could even make him a Santa hat! Extract taken from: Make Your Christmas Tree Decorations, by Susan Yeates, out now.